Ready to level the playing field? As a customer-focused financial services provider, you’re in a prime position to disrupt the big guys. Customers are looking for higher quality and are shifting their business to smaller brokers, advisors, banks, and investment firms. The passion you bring to market has not gone unnoticed. Your desire to help clients manage risk, life transitions, and grow their wealth has direct appeal for people who know the “smaller guys” deliver better service, expertise, and value. Yet, you need to let others know your story and why your firm is different and better than their other options. Sharing your story through each conversation with your sales and customer service teams is what allows your people to demonstrate the passion, purpose, and expertise. And that’s exactly what’s so compelling for attracting new clients and growing existing business. 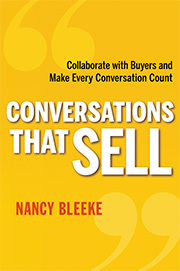 Developing powerful sales and service conversations can be instrumental—even critical—to gaining and retaining market share. There’s lots of competition out there. It’s time for you to take action to counter the big financial institutions that have created smaller, specialized investment and wealth management offerings, as well as online financial advisors. Winning market share isn’t just about managing your client’s money, but in how you can become more strategic in helping them do business and live their dreams. Conversations are the currency for your relationships with clients. Sales Pro Insider works with you to make sure each type of conversation resonates in the best way possible to contribute to growth in assets under management (AUM) and your credit portfolio. And when it comes time to replace a member of your team—or add a new one—it’s critical that your managers are equipped to effectively hire and recruit high-potential performers. Sales Pro Insider is the sales and service consulting firm that brings the spirit, knowledge, and passion to help you create conversations that sell and serve. Taking a collaborative, tailored approach to improve sales and service performance ensures your people keep and grow the attention and loyalty of your hard-won prospects and clients.